My mind runs pretty random at times, so let’s just jump into the middle of my thoughts about Daphny van den Brand. She’s an 11-time Dutch national cyclocross champion, 1-time world champion. Despite having a subpar season last year, she can be a threat in any race she enters. This is impressive considering the presence of American Katie Compton and multi-discipline killer and fellow Dutch Mariane Vos. Daphny is also kinda a babe and a hottie shorty at 1.58M (5’2”). I saw some of her pictures online and I think I really want to ride her….her cyclocross bike, that is. Because at 1.6M, I would ride the same size frame as her. Her bike sponsor last year was Merida, who are little known here in the states but build the Taiwan frames for just about every brand that doesn’t get their Taiwan production from Giant (hint: Specialized). Merida isn’t imported in the states, so I won’t be riding Daphny’s 48cm stock carbon cx frame. But then again, with a 120mm head tube on top of the 400mm cx fork I would never be able to get the bars as low as I want without resorting to some goofy stem….and I’d only do that if I was paid to ride Merida bikes. Looking at the photo above, I guess Daphy and I think alike. I love this woman. So does SlamThatStem.com. In the picture above you can get idea of Daphny’s frame size from a past season, a Merida alloy frameset which may or may not have been custom sized for her. But more recently she’s been riding the carbon bike, and as for the head tube length on a moulded carbon frame, you pretty much have to settle for whatever the manufacturer decided was right for the mass market. In a picture I lost track of, I distinctly saw how she was running a welded stem mitered in the middle to point down, and she’d even removed the the bearing cap of the headset, saving maybe 5-10mm of stack (I found the photo again, check out the middle image here: Slam That Stem). I’m not even sure how she has the front brake cable stop supported, though I assume that it’s supported by the handlebar clamp. An interesting contrast is emerging American racer Amy Dombroski’s custom Primus Mootry. At a slightly shorter 1.55M, Amy sets her handlebars much higher than Daphny, with only a 10mm drop from the saddle. Amy has an 8deg stem with about 10mm off spacer plus a typical steerer mounted brake cable stop. Her bike doesn’t have much slope to the top tube either (compared to Daphny’s carbon Merida), and many crossers seem to prefer bikes with no slope at all, though the 395-400mm axle-to-crown height of today’s carbon cx forks means that any bike smaller than 50cm must slope to some degree. On a typical +58cm size frame, 10mm of spacer and a cable stop on the steerer would be a lot lower than 10mm from the top of the saddle. I’ve been kicking around the idea of getting a titanium cyclocross bike. My preferred geometry is fairly close to the 48cm Merida, but the great thing about custom is that I can spec it with the head tube length I want. 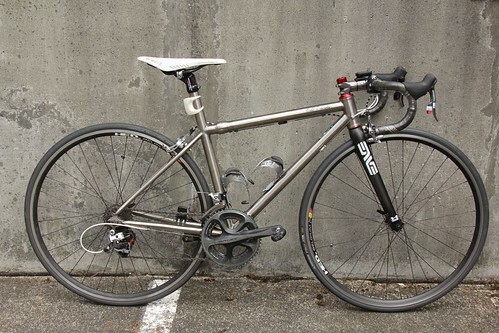 Like my ti road bike (below), it’ll have a 105mm head tube with semi-integrated headset. With a 73deg stem I’ll be able to get the bars just low enough for my personal preference for cyclocross without looking too weird. I’m sure when Daphny sees it, it’ll really be an ice-breaker. I’d definitely let her ride it.